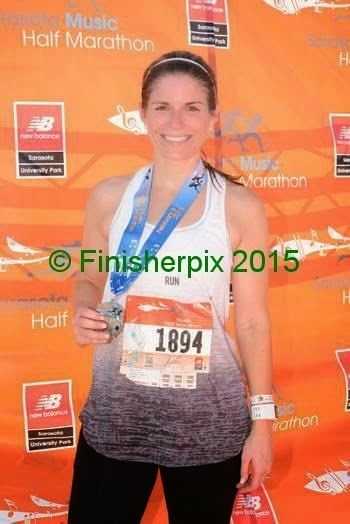 The third time may truly be the charm when it comes to my best half marathon yet! And I'm not talking about fastest, because Sunday's race was three minutes short of a PR. But I care much more about how it felt than I do three measly minutes. 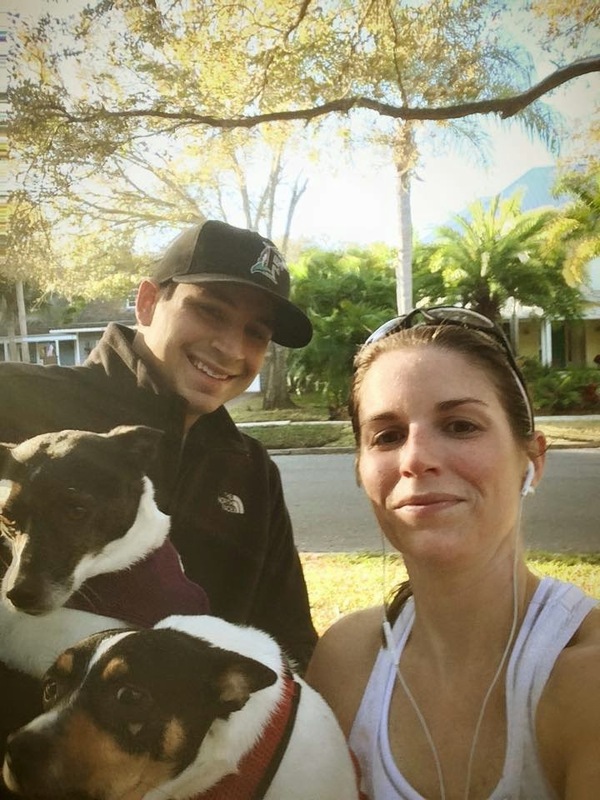 Plus, I probably spent about three minutes chatting and taking a photo with Max and the dogs at mile 8.5. The route went right through my neighborhood, so they were able to easily walk over and cheer me on. I probably shouldn't say easily since Jade barks wildly at every stranger who passes her on the street, especially if they're running. So just imagine her reaction to a 2,000-person half marathon. Max said it was fortunate there was live music, since it drowned out her barking and almost sounded like she was cheering on the runners. Speaking of that live music, the inaugural Sarasota Music Half Marathon took a cue from the Rock 'n' Roll Marathon Series around the country and had about 15 bands along the route. While they suggested you leave your headphones at home and listen to the live music instead, I did bring my own tunes and it was a great decision. I rely heavily on music to get me through tough runs, and there just weren't enough bands to provide sufficient background noise. It was a really fun addition, though, and I can't say enough great things about the race! The route was fabulous, as it took advantage of the bayfront and some of Sarasota's best neighborhoods. It took us right through Selby Botanical Gardens, which was of course scenic, and made for a fun party spot for spectators. There were Girl Scout cookies, the water/Gatorade stations were plentiful and well-staffed, and the volunteers did a fantastic job. There were even clergy blessing the runners with Holy Water...and then beer was handed out DURING the race at mile 12.5, which tasted quite divine itself. The post-race party was wonderful, complete with more beer and an enormous brunch catered by Mattison's. I also tried something different, which I think worked really well. I got a massage the evening before the race. I read mixed reviews on whether this was a good idea, but I personally always benefit from massage. Otherwise, I did my usual routine the morning of: foam rolling, compression calf sleeves and Tiger Balm. I don't think there was any magic charm, but it all came together quite well to make for an fantastic race. 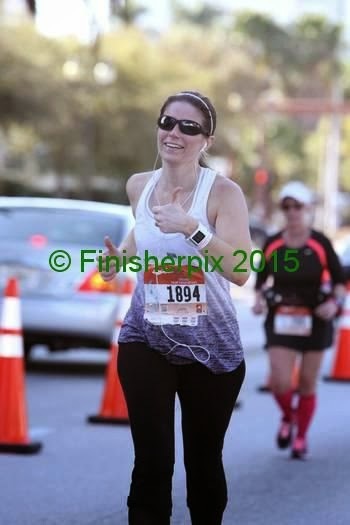 I'm not a serious runner or a very fast one, but I just do it for the fitness benefits, the sense of accomplishment and the self-imposed torture enjoyment! It was so much fun, I already signed up for next year's race!